The crown of 50 West at sunset. Photo by quallsbenson. 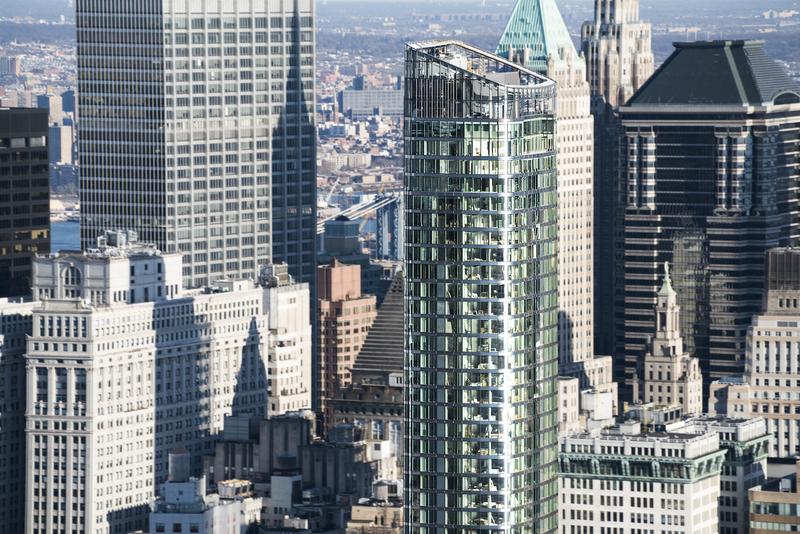 The Helmut Jahn-designed, 64-story skyscraper at 50 West Street is nearly complete and ready for residents, YIMBY has some stunning new photos, shot from a helicopter, of the 784-foot-tall tower in the Financial District. 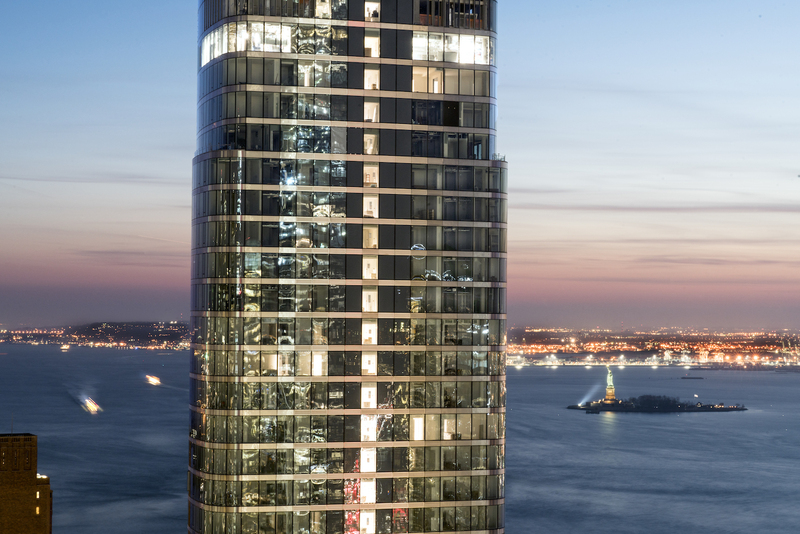 Time Equities developed the luxury building, which features a curved facade and offers panoramic, floor-to-ceiling views of the World Trade Center, New York Harbor and the Hudson and East rivers. A northeast facing view of 50 West Street, with 40 Wall Street and the Manhattan Bridge in the background. Photo by quallsbenson. Buyers started closing on condominium purchases last month, and the developers just unveiled two new model units. Asking prices for the development’s 191 units start at $1.76 million, and two dozen units are still up for grabs on StreetEasy, including a three-bedroom, three-and-a-half-bath penthouse for $24.54 million. Sales have evidently been stop and go, because the first units in the building hit the market two and a half years ago. 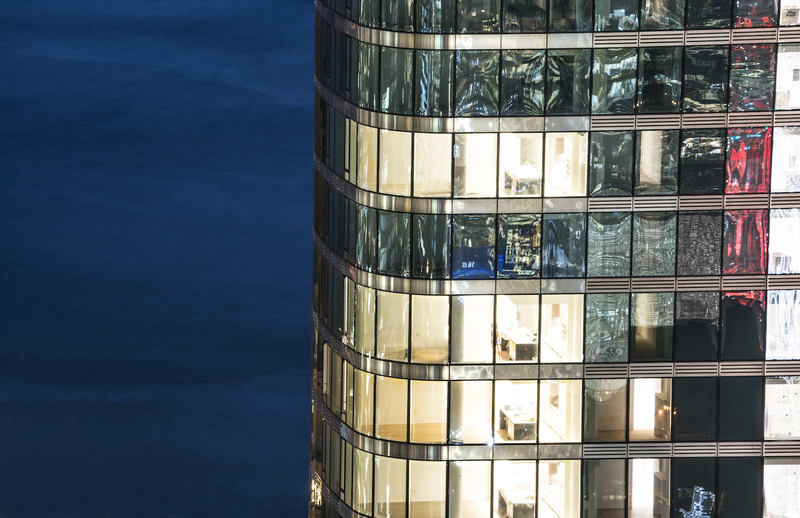 The tower has been in the works since 2007, but the recession derailed construction until 2013. The building now has a temporary certificate of occupancy, and owners are expected to start moving in over the next few months. Construction is scheduled to finish this spring. A nighttime view of 50 West. Photo by quallsbenson. Famed Danish designer Thomas Juul-Hansen handled the interiors, which are outfitted with marble vanities, marble floors and rain showers. The development will also offer four floors of amenities, including a landscaped rooftop called The Observatory at 50 West, an entertainment floor with private dining room and terrace, a fitness center and The Water Club, which has a 60-foot-long pool, a Jacuzzi, steam room and sauna. A night-time facade closeup. Photo by quallsbenson. There will also be a small commercial component to the project: the third floor will have 15 office condominiums and a conference room. Like many of the city’s tallest towers, this one comes with some privately owned public space. Time Equities is creating a 6,800-square-foot public plaza with an art gallery, cafe, plantings, tables, and chairs. The plaza was originally supposed to generate a zoning bonus for 50 West. But after the financial crisis, the developers scaled down the size of the tower and chose not to use the bonus, the Wall Street Journal reported in July. 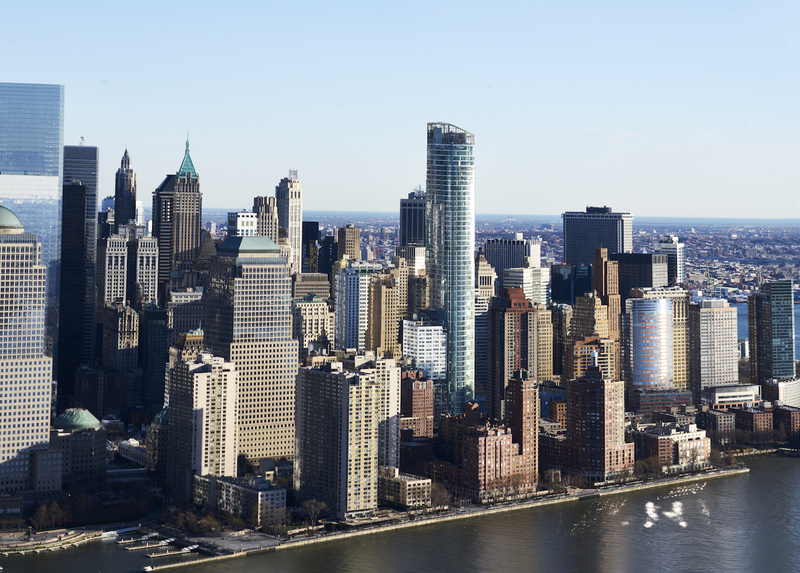 50 West makes its mark on the Lower Manhattan skyline. Photo by quallsbenson. The space will serve as a landing for the 230-foot-long West Thames Street Bridge, which will ferry thousands of commuters across six lanes of West Street every day. The bridge has been in the works for nearly a decade and will replace the Rector Street Bridge, a structure erected to temporarily replace a pedestrian bridge destroyed on September 11, 2001. The cost of the project has swelled from $20 million to $40.5 million over the years. 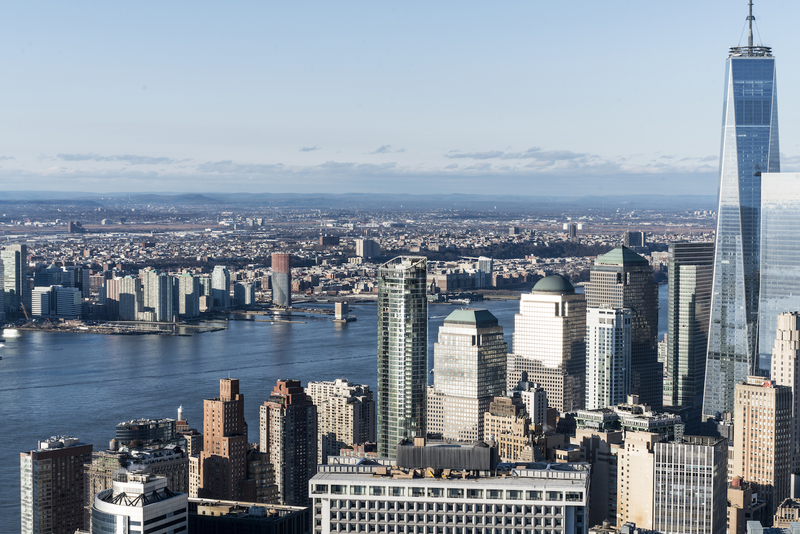 $33 million will come from the Department of Housing and Urban Development, and Battery Park City Authority, which will be responsible for maintenance, is contributing $8.2 million. The city finally started work on the bridge in November. 50 West looks like it should dominate the skyline, but it doesn’t even crack the top ten tallest towers in the Financial District. It’s slightly shorter than the century-old Woolworth building, which reaches 792 feet above Broadway. 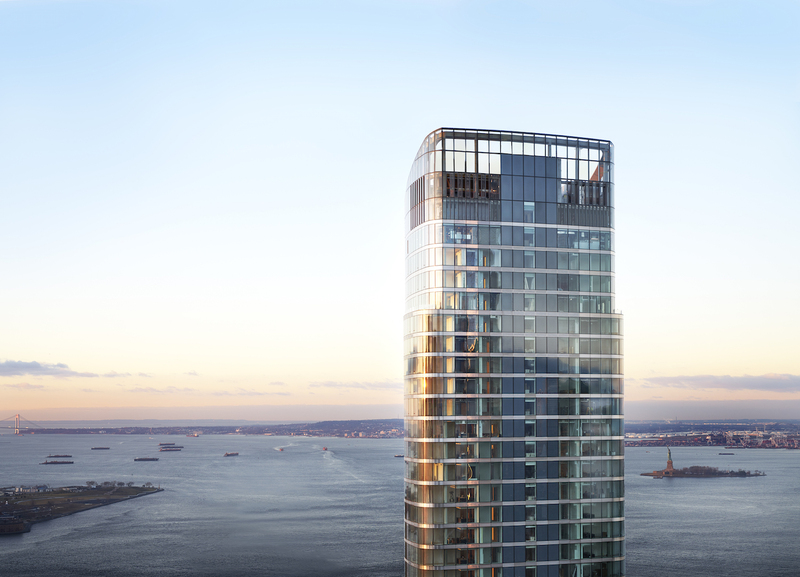 The Robert A.M. Stern-designed Four Seasons condo-hotel at 30 Park Place was finished last year and stands 937 feet tall. Gehry’s wavy condo tower at 8 Spruce Street has a height of 870 feet, and the 71-story 40 Wall Street (pictured above), an office tower controlled by President Donald Trump, is 927 feet tall. One World Trade Center remains the loftiest in the neighborhood and the city, at 1,776 feet tall. A northwest facing view of 50 West Street, with New Jersey in the background and One World Trade Center on the right. Photo by quallsbenson.